This Crab Corn Egg Salad is so fresh and flavorful. 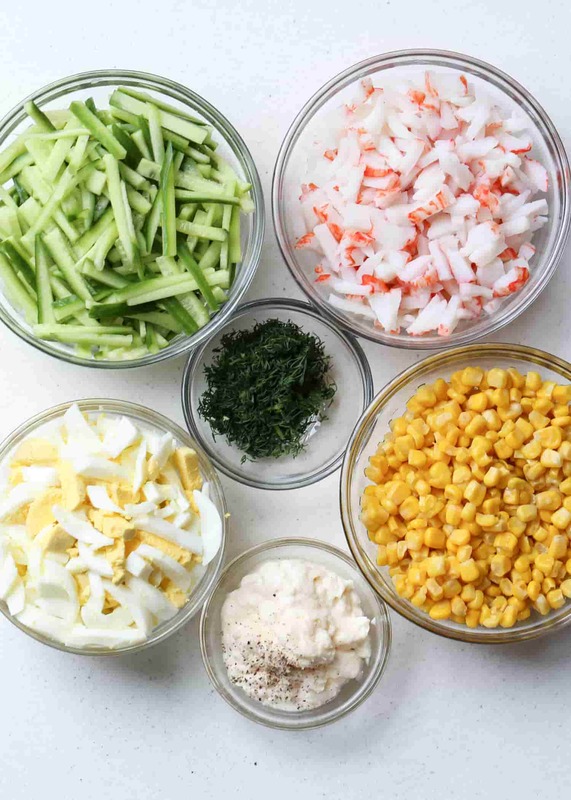 You’d never expect an egg salad to taste so wonderful with cucumber, corn, and crab. Crunchy and fresh, perfect for any time of year. Egg Salad – a Summertime Must! I cannot wait for you to try this Egg Salad. It’s a favorite of mine during summer. I love how all of the ingredients come together and have so much flavor. This salad is a great salad to serve at a family gathering, a potluck or picnic. Just add all the ingredients together and mix with the mayo dressing right before serving! How should I cut the ingredients? The secret to this egg salad is the way you cut the ingredients. You want them all to be the same size. Everything may either be cubed or thinly sliced as I have in the step-by-step photos. What kind of crab meat should I use for this crab salad? Can I substitute the dill? Dill is one of my favorite herbs. (If you are not a fan of dill I am not sure we can be friends (just teasing)..). Dill is a favorite herb in the Ukrainian/Russian community. We really use it in just about everything. In this salad, dill is like the cherry on top of an ice cream. So, if you don’t want it, just leave herbs out completely. What kind of corn should I use for the corn salad? Fresh corn is best in any salad. However, if fresh corn is not in season, canned corn will do just fine. Just drain water before adding to the salad. How to cook fresh corn for this salad? Add corn and cover with water. Bring to a boil. Cook 8-10 minutes until desired tenderness is reached. Remove corn from water and COOL completely before adding to the salad. Other great salad recipes to try! 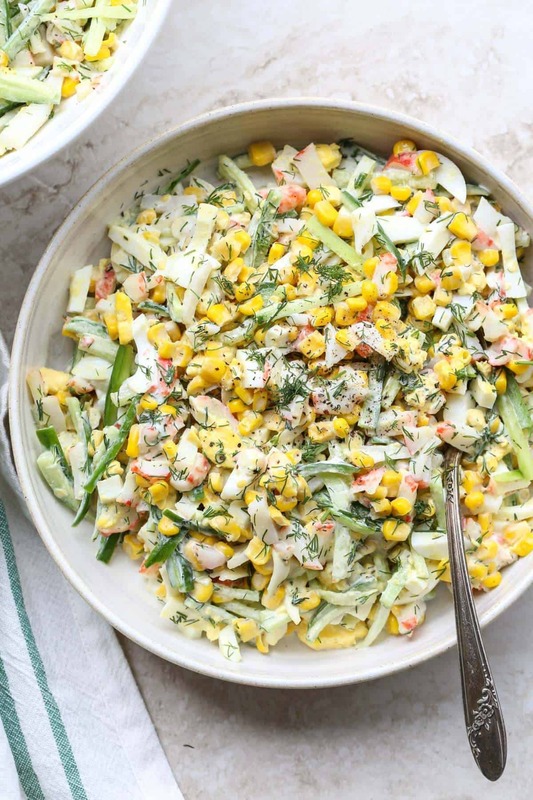 Cabbage Corn Tomato Salad- A mix of cabbage, corn, tomato, and cucumber in a mayo dressing. Broccoli Salad- Combination of broccoli florets with the almonds, bacon, craisins and sunflower seeds. 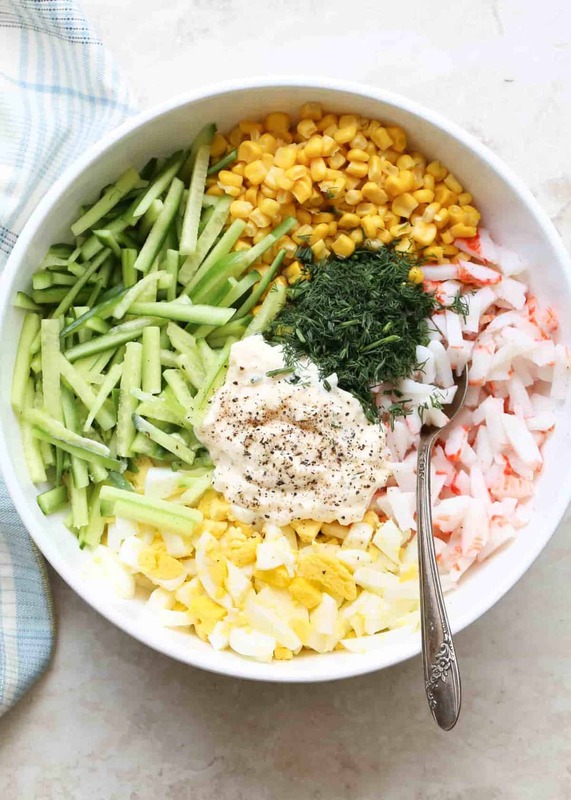 Salad with crab, cucumber, corn, and egg in a mayo dressing. Cut the eggs, crab, cucumbers (either julienne or cubed). Place all of the ingredients in a bowl. Mix. Enjoy. Salad stays refrigerated for a few days. Keep covered. Hi Valentina:) I wanted to ask- what salad would you recommend most to bring as a side for Christmas dinner? I’m eyeing these crab salads and wasn’t sure if you had a favorite?? Also wanted to ask- never made fresh crab meat before- what do you do to prep that as I would probably go the fresh crab meat option if that is what you do/recommend. Thank you Valentina!! Hi, Mary! Thanks for visiting our online home. For Christmas, you want something that’s a little more festive and I’d go with THIS salad. You can purchase a few crab legs and cook them or get canned crab meat. 🙂 I hope that’s helpful. Have a most wonderful dinner! Ooohh this sounds really good! I wouldn’t have thought of putting eggs and carb meat and corn together, but it sounds great! Thanks, Melissa. It’s a wonderful combination indeed. Looks delicious! We make a similar salad, only we add romaine hearts instead of cucumbers. I definitely want to try your version though. I love your recipes, so simple and so delicious! Awww, Marina. You are so so sweet. I truly appreciate the wonderful comment, makes me smile oh so big. Please tell me more about your salad, it sounds great. Do what do you use as the dressing? 🙂 For dressing I use mayo, and I do add green onions, if I have on hand. So it’s romaine hearts, eggs, crab meat, corn, green onions, mayo, and dill. I love it! Thanks so much for sharing, I can’t wait to try it :)! Oh wow, Marie. That sounds wonderful. Did she use mayo as the dressing or something different? I’m going to try that!